Madison: I had the immense privilege of joining Professor Kim Wilson’s research team on the Financial Journeys of Refugees Project. We went to Medellín, Turbo, and Capurganá, Colombia to do ethnographic research on migration, and a gender analysis. Claire: I avoided the Boston winter and traveled to Miami, Costa Rica, and Arizona for vacation and to visit family. I ate delicious food in Miami, enjoyed sloth stalking and beach time in Costa Rica, and reread the Harry Potter series while in Arizona. 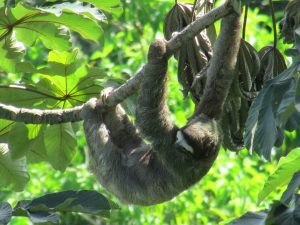 Here is a picture of said sloth taken from the balcony of the place where I stayed in CR. 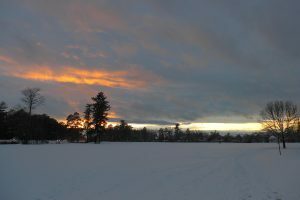 Wendy: I enjoyed many chilly walks and snowy sunsets in Vermont. 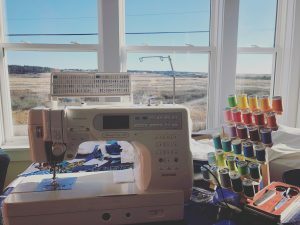 Sasha: I think my break was decidedly unexciting, but here goes: I spent two weeks at my parents’ house in rural Nova Scotia doing capstone research and sewing in front of the fire. I run a small business sewing bags and after the Christmas rush, it was nice to take a break and sew for fun. I started my first-ever quilt; now the challenge will be to find time during the semester to finish quilting it. 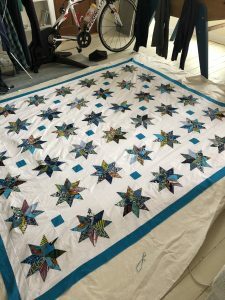 The photos show the view from the sewing machine and the quilt in progress. 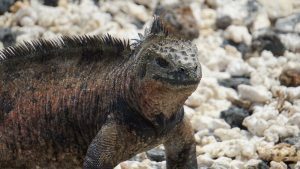 Victoria: Over break my husband and I went to Ecuador and the Galapagos Islands for our honeymoon! We visited Quito, Mindo, Isla Santa Cruz and Isla Isabela (both Galapagos) over Christmas and took lots of pictures of cute animals! Kevin: For winter break, I became a parent for the first time, adopting a one year old puppy, Amira! 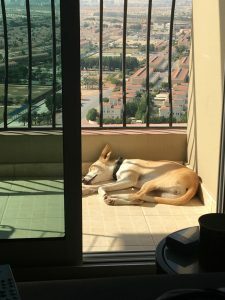 Amira is half Saluki and half Arabian Greyhound, born in the UAE. She loves to watch television and survey her queen-dom over Dubai, when not sunbathing of course! Research Assistant for Russia, Rising Power Alliances Project (CIERP, Fletcher): conduct research on Russian defense strategy and foreign policy for a grant headed by Prof. Mihaela Papa examining alliances and coalitions among rising powers in global governance. Due Diligence Cocoa Law Project (Harvard Law & International Development Society): work with seven Harvard Law students to assist the NGO Mighty Earth in drafting a due diligence cocoa law covering environmental and human rights concerns for Congressman Elliot Engel (D-NY) to introduce in the House of Representatives. Work-Study Corps (Dance Complex, Cambridge): work as a volunteer receptionist in exchange for free dance lessons. Carlo: Hello from sunny Colombia! 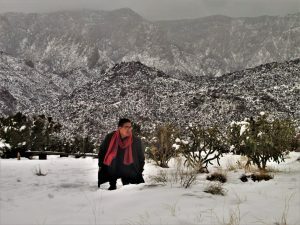 I am assuming that a lot of people will send pictures from beach, so here’s a shot from the other half of my break, braving the snowfall in New Mexico’s high desert. Seems like there was more snow in the Southwest than Boston.